Hear ye! Hear ye! The long-awaited fruit of the most recent, and certainly most wall-shaking, collaboration between Otaku USA and Weekly Famitsu is on sale now! The 9/24 issue of Japan's venerable TV Game magazine offers readers a trip through "Otaku World Culture" via the results of the 2009 Foreign Otaku survey and special contributions from the OUSA staff. The Famitsu spin machine is promising a thorough look at the "rich and realistic" lives of Western otaku and gamers. And since YOU supplied the raw data, this epic celebration of international-brotherhood-and-understanding is very much yours to enjoy as well! Ok, so here's the cover of the new issue of OTAKU USA. 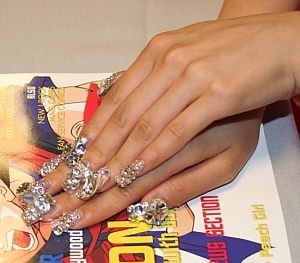 As you can see, we've really got our finger on the pulse of foreign fandom this time with a Full Metal Alchemist: Brotherhood cover feature and, as per usual, there's all sorts of wonderful J-pop weirdness lurking within as well. Things I like about this issue: Patrick W. Galbraith (author of Kodansha International's new Otaku Encyclopedia) joins our crazy cast of contribs, Jason Thompson's interview with manga-ka Hitoshi Iwaaki (Parasyte) finally sees the light of day, and Daryl Surat makes all of our heads collectively explode at once with the sheer brute force of his lengthy tribute to the Fist of the North Star theatrical film. What else? 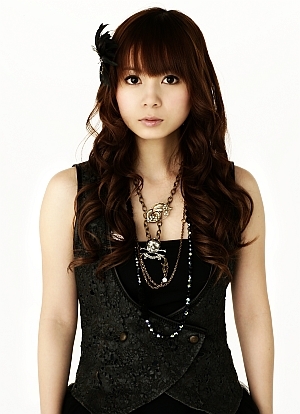 Zac Bentz pulls off a believe-it-or-not interview with Morning Musume's Ai Takahashi and Mike Dent defty duets with Hikaru Utada (perhaps you've heard of her) on a back page Q&A. Also fun: not-for-sissiesss manga excerpts from Broken Blade (CMX) and Takeru (Tokyopop) and an off the cuff tribute to Toei action classic Roaring Fire just because we're like that sometimes. Look for it on sale at your local bookstore, news vendor, and cigar shoppe in about a week or so with loyal subscribers getting theirs very soon after. In the meantime, learn more about our humble publication our official website. "Japan has more than a thick layer of geeks"
ON SALE NOW! The OTAKU USA mafia invades the 12/19 issue of Japan's venerable TV Game magazine Weekly Famitsu. Our staff contributes lists of their all time favorite anime and games, while I ride point on an introduction to our magazine and general Gaijin Otaku 101. 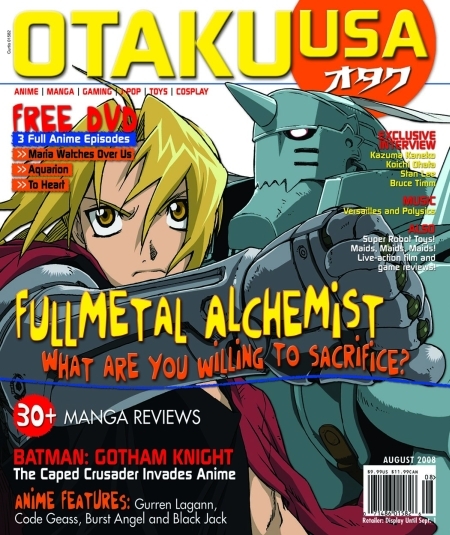 On a semi-related note: the Jan/Feb 09 issue of OTAKU USA should be shipping soon and some big changes are ahoy. To wit: we are dropping the DVD, ditching the polybag, and lowering the price to $5.99. Subscribers get their remaining issues increased by 50%. Please consult the OTAKU USA FAQ for further clarification. Thank you! The killer contents are pretty much all right there on the cover, but here are some things I like about this one: The big old school Macross flashback with the contribs firing on all cylinders, Daryl Surat on Gundam 101, scans from various host club magazines, reviews of Golion and Dai Majin, a whole page on Super Robot Red Baron, pics of the hot chicks from Thee ’50s High Teens, fan letters from Malta and Danny Tanner, using “the war in space” on the cover. The heroes who made it happen: Matt Alt, Brian Ashcraft,Yunmao Ayakawa, Emily Balistrieri, Zac Bentz, Casey Brienza, Austell Callwood, J.L. Carrozza, Paul Thomas Chapman, Ed Chavez, Mike Dent, Caleb Dunaway, Tim Eldred, Erin Finnegan, Shaenon Garrity, Clarissa Graffeo, Heidi Kemps. Gilles Poitras, August Ragone, Dave Riley, Daryl Surat, and Darius Washington. Yeah. Ok. Shokotan blogged about me today. 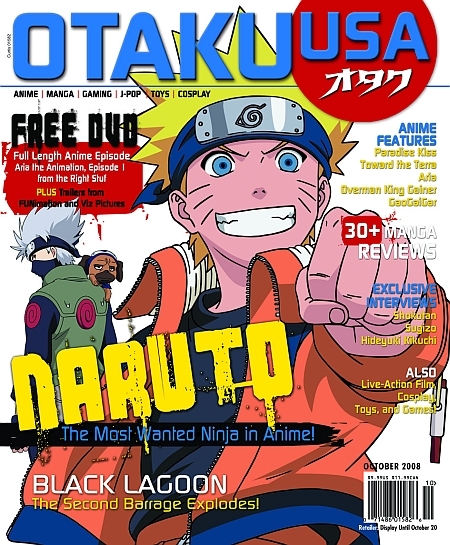 ...and then there was issue 8 of OTAKU USA magazine! Hey, this one is pretty good and should be hitting subscribers and stores near you starting next week. Big features on Black Lagoon: The Second Barrage, Overman King Gainer (with a “Kill ‘em all” Tomino sidebar), Paradise Kiss, Toward the Terra, and a huge fold-out poster for GaoGaiGar. And with Shippuden on the horizon, we're actually dropping the Naruto bomb again with Joseph Luster leading the charge of the light brigade. Oh yes. Things I like about this issue: The Shokotan interview, the Sugizo interview, the Hideyuki Kikuchi interview, the old poster of Odin I dug up, letters demanding the return of Megaman NT Warrior, Mike Toole making his OUSA debut with a review of the New Fist of the North Star / Neo Tokyo Double Pack, the Melancholy of Haruhi Suzumiya manga excerpt, exclusive art from Machine Girl, reviews of Rodan and War of the Gargantuas. And of course pictures and writing about anime, manga, and Japanese pop culture in general by the likes of Matt Alt, Brian Ashcraft,Yunmao Ayakawa, Emily Balistrieri, Zac Bentz, Casey Brienza, Austell Callwood, J.L. Carrozza, Paul Thomas Chapman, Ed Chavez, Mike Dent, Caleb Dunaway, Tim Eldred, Erin Finnegan, Shaenon Garrity, Clarissa Graffeo, Heidi Kemps. Gilles Poitras, August Ragone, Dave Riley, Daryl Surat, and Darius Washington.